New Syracuse University undergraduate students from around the globe came together under the roof of the Carrier Dome on Aug. 21 to meet each other and members of the University community, share a meal, and learn more about Syracuse—the new place they call home. Students and Otto the Orange at the International Student Welcome Dinner. This was the University’s first International Student Welcome Dinner for incoming international students. The dinner was planned by Dr. Ruth Chen, professor of practice in the College of Engineering and Computer Science; Michelle Larrabee, events coordinator in Hendricks Chapel; and George Athanas, interim director of the Slutzker Center for International Services. University faculty, staff and friends served as table hosts. Raices Dance Troupe and Andre Sanchez, a sophomore in the College of Visual and Performing Arts, gave performances. This fall, Syracuse University has welcomed more than 500 international undergraduate students from more than 50 countries. Speaking to the new students, Athanas encouraged them to delve into the Syracuse University experience by leaving their comfort zones. Chancellor Kent Syverud encouraged students to embrace the Slutzker Center and its staff, the values of the University and the hundreds of student-run activities that take place on campus. He told the students that both he and his wife, Dr. Chen, were international students more than 40 years ago—Chancellor Syverud in Colombia and Dr. Chen, a native of China, in the United States. The evening concluded with an ice cream social at Hendricks Chapel and a group photograph on the chapel’s iconic steps. Students were also introduced that evening to the University’s newly launched International Friends Program. 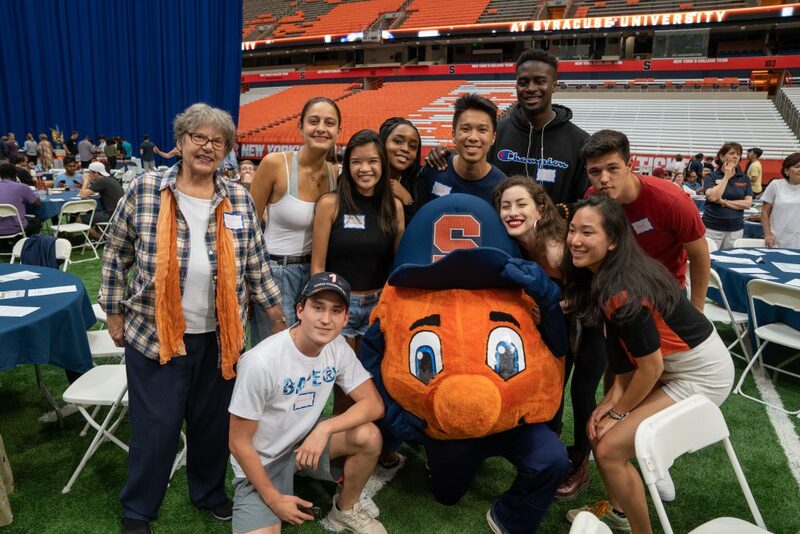 The program is designed to connect interested international undergraduate students with a faculty, staff or community member to help introduce them to the many offerings—academic, athletic and cultural—of the SU and larger communities. Those interested in being a Syracuse Friend for International Students are asked to contact Michelle Larrabee at 315.443.2903 or melarrab@syr.edu by Thursday, Sept. 13.